What does this mean for its 400,000 inhabitants? In a city defined by the uniqueness of its historic neighborhoods, and yet quickly growing/changing, how can urban greenspace be maintained, improved, connected and expanded to preserve culture and quality of life in an equitable way? 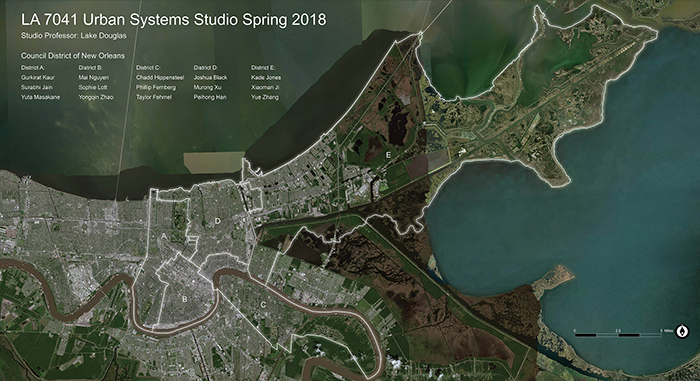 Using urban conditions in New Orleans, the graduate level LA 7041 studio at the LSU Robert Reich School of Landscape Architecture investigated how urban green infrastructure and its management can become vehicles for community engagement and empowerment and improve urban conditions for community residents -- starting with data-driven assessment, and culminating in the development of site-specific design strategies. This studio combines the work of 15 RRSLA students, with guidance from their professor & community partners. "While participating in the LA 7041 Urban Systems Studio with Lake Douglas and my student peers, I’ve learned about the importance of community engagement throughout the design and implementation of a project. Keeping the voice of the people as the foundation of an open and equitable greenspace project should be a top priority. Active engagement from start to finish will lead to a design with greater community benefits."